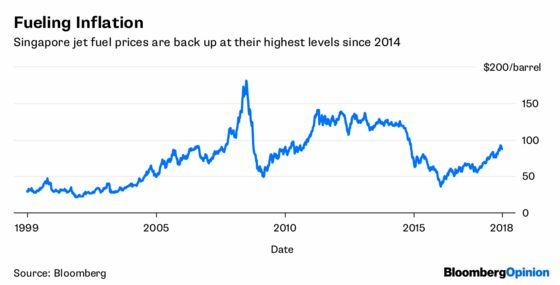 (Bloomberg Opinion) -- The aviation industry’s perennial bad judgment in forecasting oil prices seems to be about to land it in trouble again. A generation of ultra-long-haul aircraft, designed to allow airlines to bypass global hubs and fly nonstop between almost any two points on earth, are coming into service after years in development. Qantas Airways Ltd. will now fly you direct to London from the western Australian city of Perth in a Boeing Co. 787-9 Dreamliner, and is planning to do the same from Sydney and Melbourne. Singapore Airlines Ltd. last week announced plans to restart a 19-hour route from its home base to Newark on Airbus SE’s A350-900 Ultra Long Range aircraft from October. As we’ve argued before, such flights could reshape aviation the way the 747 did in the 1970s and 1980s. But there’s a threat to that vision that’s coming into focus just as the new jets are readied for delivery: Oil. Jet fuel is the biggest single expense for most airlines: The bill typically runs from 15 percent to as much as one-third of revenue. As a result, oil prices are a key factor separating periods of bumper profits from downturns. With Brent crude topping $80 for the first time in three-and-a-half years last month, earnings have peaked and will fall next year, Alexandre de Juniac, outgoing chief executive officer of the International Air Transport Association, told an industry meeting in Sydney last month. That problem is profound on longer-haul flights, where a passenger jet is almost a flying fuel tanker. The weight of fuel on board a fully laden A380 or 747 is more than twice that of all the passengers and cargo. Only a few long-haul jets, such as the 787-10 and A330, are designed with the ability to carry a greater mass of payload than fuel. One advantage of breaking a route at a hub airport is that a refueling stop spares you the need to carry the kerosene for the second leg of the flight from the first take-off. 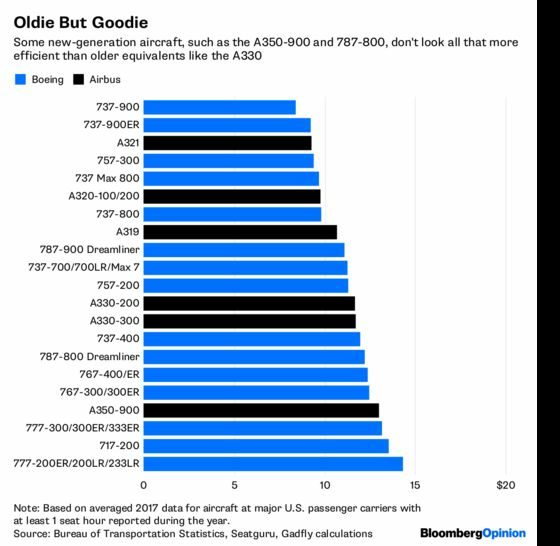 For all that Airbus and Boeing boast of breakthroughs from new-generation engines and carbon-fiber fuselages, the 787 and A350 haven’t fundamentally changed that dynamic. Many of the benefits come from the way the new planes have replaced four-engine, gas-guzzling 747s and A380s, rather than in basic improvements over twin-engine jets like the 777 and in particular the A330. Eking out efficiency gains in aviation is supremely difficult: The industry as a whole consumes about as much per seat-kilometer as it did in the late 1940s, because turboprops tend to sip less fuel than jets. 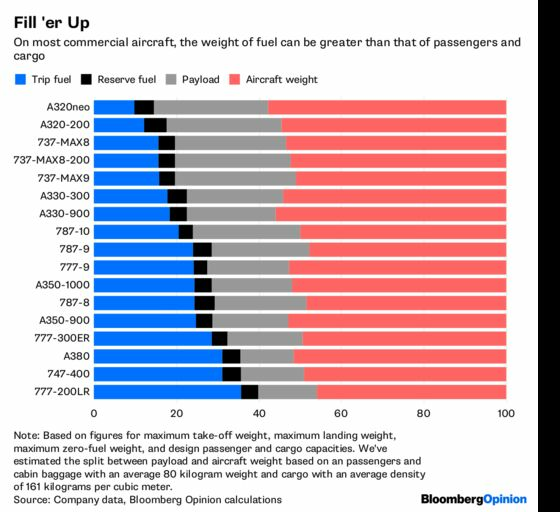 Does that mean the 787 and A350 are destined to go the same way as the A340 – the four-engined, gas-hungry intercontinental tank that Airbus introduced in the 1990s and discontinued in the mid-2000s as crude prices commenced their march to $150 a barrel? Perhaps not. While the cost advantages of ultra long-haul jets may be slight, they’re likely to make up for it in market positioning. That’s because the passengers driving the profitability of 21st century aircraft aren’t the ones in coach, but the business and premium travelers at the front of the plane for whom a few hours shaved off a journey is a killer advantage. On routes from its home base that involve hanging around a transfer lounge in Los Angeles, Dubai, Beijing or London for a connection to New York, Singapore Airlines is competing with dozens of carriers. On those that fly the route direct, it has a monopoly. While those business travelers are time-sensitive, they’re supremely insensitive to ticket costs, especially if a slice of the tariff is in the form of a fuel surcharge. Singapore Air’s previous attempt at a direct New York route, an all-premium trip on A340s, was only discontinued in late 2013, when Brent crude had barely dipped below $100 in three years. That’s reason to expect that the current generation of ultra-long-haul routes will prove resilient, even if crude prices keep marching higher. The manufacturers may brag about efficiency, but the real benefit of the new planes is more about boosting revenue than reducing costs. With airline economics increasingly driven by premium passengers, the quickest jets to span the globe won’t wilt at the first sign of pricier fuel.